Ryoko Garcia of Bella Day Spa and Salon in Navarre, Fla., shows how to make this Hawaiian-inspired nail art. Ryoko Garcia (@nailsbyryoko) of Bella Day Spa and Salon in Navarre, Fla., shows how to make this Hawaiian-inspired nail art. 1. Buff the surface of the nail and cleanse with alcohol. 2. 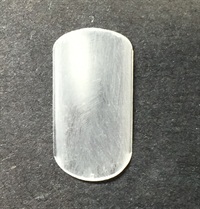 Start drawing lines using white gel-polish. 3. Draw thick lines of white, apply two coats and cure each coat. 4. Start drawing a hibiscus using acrylic paint. 5. Draw thin lines to add details using blue acrylic paint. 6. Add more details in the middle of the flower. 8. Place pearls. Apply gel top coat and cure.